... especially when you get hit by it when it goes 180. The wagons (which was what I began with) are based on linedrawings of the Dutch "Plan E" wagons which you can find here and then altered while looking at the wagons of the Southern Pacific's Daylight here to get the various wagon types. The E-2 locomotive, introduced here, is based on the OTL DRG Class E 19. I used this picture and shrunk it to about the same size of the wagons and worked with that. While I can't remember having ever travelled with those wagons, I know I have traveled with the Mat '54 trains which I believe have the same types of doors you can slide open while the train is still moving (which I have seen several time). Also not visible are the Chinese spies who were run over by the Nippon Express when it left the station. 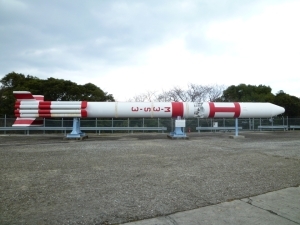 The three smaller ones are of the not-appeared-in-the-news-yet-but-soon-will-be Tsubame rocket with its booster in the second and third picture (a bit like the US's WAC Corporal + Tiny Tim booster) and the two bigger ones are the Hibari rockets (with the bigger one being the newer Hibari II) that have been mentioned in the Japanese news. ... and perhaps I should call that red "Hergé Rocket Red". I used the black-and-white roll pattern scheme for the French rocket as that would fit better with the French tricolor on the tail fins than if I use the red-and-white recovery and roll pattern scheme I used for the Japanese rockets. Edit: Using Radome's V-2 rocket pic at Shipbucket as a bit of a guideline, I added some guess of the Argo-Lantean AAM-5 rocket as well, using the Gold-2 color scheme (well, it is actually a b&w photo so Hood could have something else in mind)... no idea about the other Argo-Lantean rockets, but will take a look tomorrow. R1 was actually supposed to be a larger and improved version of Jean-Jacques Barre's Eole; but with a weight of 1,300kg it's about 1/3rd the size of the design it's theoretically supposed to be based on. I presume my notes got mixed up somewhere or another, hence why I referred to it as "monstrous" when it's not actually that large. Best explanation at this point is to say that R1 is intended as a basic sounding rocket for mass production, and that there's a larger and more powerful "Eole II" still in development for later, for which the "monster" definition might be more appropriate. Okay, I will look at the Eole and mess around with that tomorrow. Added a few more rockets, including the LePrieur Incendiary Rocket and variants made by the Japanese since the Great war for comparison. Considering its weight, I made an Eole-like rocket for the R1 which is about the size of the similar weight Veronique NA/AGI rockets. I could see the R1 being similar to the Argo-Lantean AAM-3 where it is a scale testbed for a bigger version but at the same time also a basic mass production version Brock mentioned. No idea about the AAM-4 but it is only 5 cm shorter than the AAM-5 (you can count the pixels if you want to but trust me when I say that the AAM-5 is 1 pixel longer than the AAM-4 ) and a little bit less thick. I made the AAM-4 roughly the same as the AAM-5 with some minor visual tweaks here and there. I think it is mainly an internal upgrade of stuff. Now considering that Hood used a pic of the Blue Streak for the AAM-3, I could use that one as base, but the AAM-3 is supposed to be a scale testbed for the AAM-4 so I can't really use the dimensions of the Blue Streak for the AAM-3. Well, it would need some changes to become the R-7. While it might not be entirely visible, the lower part of the 2nd stage of the Hayabusa is actually the lower part of the Misago rocket (which is a slightly fatter Jupiter C to match the diameter of the lower part of the R-7's second stage). Then there is the Atlas A nosecone on the top one that would need to be replaced by the pointier one the Russians used (either the short one or the long one) and the Mercury-like capsule on the bottom one that would have to be replaced by the Vostock capsule. Of course the colours would have to be changed as well. I like the R-7 a lot. It kinda sends the message of "The Exploration Of Space Through Brute Force." On the other hand, why bother with my crappy pictures when you can use this one? Bit of a color test using one of the rockets. The first one is the one that has been posted above. The second one uses markings that are more like those used on the Mu rockets and I took the colors from a photo of a Mu rocket. The third one uses the same markings as the second one, but has actual pieces from another photo of a Mu rocket rather than coloring it by hand. Parts are from Colosseum's FAL image, Satirius's AR-10 image and Darth Panda's Type 99 image. The bayonet is based off a few photo's of the Type 30 bayonet (haven't thought of a designation for it yet) as are its colors (which are deliberately slightly different from those of the weapon, being made by a different plant, different material processes, different wood, etc). The rounds are made by sticking a shape outline of what I wanted over a shrunken image of an actual round.